Concluding what has felt like my residency at London’s Royal Albert Hall, I attended my third film music concert there in the space of two weeks (having missed out on some others in between) – following Michael Giacchino’s 50th birthday concert and a tribute to James Horner came the world premiere on 3 November of James Newton Howard: 3 Decades of Music for Hollywood, which will be touring around Europe in the weeks ahead. This fine composer has never conducted a full concert like this before (though he did have a concert in his honour in Vienna a couple of years previously and conducted half a concert in Bilbao in 2016). He bounded onto the stage and launched into the main title from Fantastic Beasts and Where to Find Them, which segued directly into a lengthy suite from Snow White and the Huntsman. When I looked at the setlist, I was less than thrilled to see four cues from that score appearing, none of which being its standout cue “Sanctuary”. Well, somehow Howard constructed something remarkable, a thrilling powerhouse for orchestra and choir (the latter with powerful, devilish Latin chanting in “Warriors on the Beach”, sounding so much bigger and more expansive than on the album) which absolutely brought the house down: the guy in front of me stood up and yelled “WOW!” as soon as it finished, having said beforehand to his partner that he couldn’t believe it was on the programme and this was a reaction shared by pretty much everyone. What a way to start. A suite from Peter Pan followed. While here (and elsewhere) there were electronics present, it was nice to hear “Flying” in particular with a slightly more orchestral sound than it had in its original incarnation. The composer then said a few words about his relationship with M. Night Shyamalan, and (in a really unexpected highlight) took to the piano to explain how he found a way of turning the suspenseful three-note motif that runs through Signs, which was written before filming had even begun, into an emotional release. He then returned to the podium and conducted the score’s main title and (not listed in the programme) “The Hand of Fate, Part 2”, leading directly into a brief excerpt (conducted to picture) from The Sixth Sense and then the absolute highlight of the evening, the stunning “Flow Like Water” from The Last Airbender, accompanied by images from all of the composer’s films for Shyamalan. The place was shaking, not just from the huge sound of the orchestra and choir, but with the excitement in the auditorium – an unbelievable few minutes. Howard then spoke about one of his longest-standing collaborators, and good friend, Lawrence Kasdan (who wrote an introductory note to the concert programme) before conducting a suite from Wyatt Earp, one of his best scores. Then, unbilled, came “The Hanging Tree” from The Hunger Games: Mockingjay Part 1, sung on this occasion by the composer’s daughter Anouk, sounding uncannily like Jennifer Lawrence. I don’t really understand why it wasn’t done as part of the suite from those films earlier on, but in any case it was a good way of ending the first half. The second half opened with “Inner Sanctum” and “The Egg Travels” from Dinosaur, the first (and best) of three animated scores Howard did for Disney (he lamented their lack of success in his programme notes). The latter part in particular, with its big African-flavoured choral element, was really good. Before King Kong, Howard recalled being offered the gig (“I knew straight away that it would need three hours of music, I knew straight away that there would be no time to write it, and I knew straight away that I would say yes”) and then showed the “Central Park” sequence without music before conducting the piece to picture, to show what an impact music actually has on a film (as ever when these things are shown, it was quite eye-opening). A suite from romantic comedies followed, opened with Howard himself playing the theme from Dave on the piano, with the orchestra then joining in for Pretty Woman and the composer returning to the podium to conduct the very enjoyable “Chase” from My Best Friend’s Wedding. In stark contrast to this was the next piece, the highlight of the second half, “Tarawa” from Snow Falling on Cedars. I was half-expecting the concluding drum part of the cue (after the choral might dies down) to be trimmed, but in fact quite the reverse, with the percussionist giving it some real welly, sounding much bigger than it has ever sounded before. A few years ago Howard wrote a violin concerto for James Ehnes and the virtuoso appeared on stage to play “The Gravel Road” from The Village, one of the composer’s most famous pieces, and rightly so (it’s so beautiful); then came something very different. Howard strolled over to the piano and launched into an amusing story about his big break in life (out of nowhere being given the opportunity to become part of Elton John’s band in the late 1970s), all accompanied by an amusing little animation about the experience. After this the composer played a piece for solo piano he had written very early in his career, but never recorded (sadly I don’t recall what it was called), surprisingly well-developed and mature-sounding. Blood Diamond was represented by “London” and “Solomon Vandy”, the Crouch End Festival Chorus managing to do its best African impression, the highlight being the solo vocalist who appeared, Velile Mchunu, but whose name was never announced by Howard (“You have to do these weird clicking sounds”), which did seem a little disrespectful (but may have been a joke). The composer introduced “Harvey Two-Face” from The Dark Knight with an amusing anecdote about working with Hans Zimmer (who was in the audience) and how different the experience was from his usual composing routine, before the scheduled programme ended with a spectacular suite from Fantastic Beasts, for which Howard wrote a number of very fine themes – I hope he gets to revisit them in future. After massive, extended standing ovations the composer returned to the podium to conduct a suite from my personal favourite score of his, Maleficent, with the album’s “Suite” combined with the finale “Queen of Faerieland” for yet another thunderous, rousing piece. If that was not entirely surprising as an encore, the second one was much more unexpected (in fact, there even being a second encore was rather unexpected and quite a lot of people left before it) – the theme from Prince of Tides. Howard introduced it by rather sadly noting that he would never be able to write music like it today – too emotional, too sentimental – and it really is a ravishing piece, surely his most romantic. 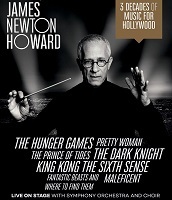 There’s been a bit of chatter about the set-list – unlike Giacchino a couple of weeks earlier, Howard’s body of work is so big that there would inevitably be more difficult choices to make – and there were some surprising absentees (the fanfare from Grand Canyon, anything from The Fugitive or Waterworld, and in particular the spectacular “The Great Eatlon” from Lady in the Water) but clearly there wasn’t time to do everything, and including intermission the concert lasted a shade over three hours so it was hard to complain. The performance by the young musicians of the Royal Academy of Music Symphony Orchestra was exemplary (they will be replaced by the Czech National Symphony Orchestra – who have accompanied Ennio Morricone in recent years in his concerts – for the remaining legs of the tour, but Howard is an honourary member of the Academy and at the moment a visiting professor, so it was natural that he should choose them to play while in London) and Howard was visibly overwhelmed by the positive reception his music received: he initially appeared to be genuinely nervous that people wouldn’t like it but, needless to say, everyone loved it – the reception he got at the end was bordering on worship. If you get chance to go and see him, do take it – experiencing this music, carefully selected and in many cases edited and arranged specifically for the concert, was a joy to behold. I’m going to the concert in Amsterdam on Tuesday. Cant’s wait. Excellent review — wish I could have been there! I was there and enjoyed it a lot. I’ve seen many great composers perform at the Albert Hall (Goldsmith, Doyle, Arnold, Horner among others) and JNH was fantastic too! Highlights for me were The Last Airbender, Wyatt Earp, and Dinosaur. The only disappointment was the lack of Waterworld and (the very underrated) Postman. If I could have changed anything about the concert I would have removed the odd bits of film dialogue that were used during some quiet moments. Overall it was an amazing evening! Sounds like a great concert. I wish he’d come to Israel as part of this tour. The set list is a bit disappointing though. It’s obvious he chose the more popular works over the more quality ones. While it’s impossible to include all his career highlights in a 3-hour concert, the absence of Atlantis, Waterworld, The Lady in the Water, Hidalgo, Restoration, The Postman, Defiance and several others is nevertheless quite hard to justify. JNH is one of my favourite composers and his music deserved the rapturous applause that accompanied each selection. ‘Flatliners’ opened in Cape Town on Friday, and I was hoping that JNH`S score for the 1990 original version would be included in that Concert lineup that you were so lucky to attend James….I loved ‘Flatliners’ choral score [in spite of the Synthesized Orchestral backing] and hope it will be released in the near future, as the release of the current film has again sparked interest in the 1990 original that tackled the ageless controversy as to what happens when we die. There was talk of FIMUCITE recording a programme of HOWARD`S music, and I was hoping that a ‘Flatliners’ suite would be included in the compilation. I`ve been unable to track down an album—do you know if it was ever released James? Eh, that sounds fantastic. Shame none of these want to come out to Australia – we only got Zimmer, which was the worst concert I’ve ever been to. The concert in Budapest was also great and unforgettable. Unfortunately the venue (Budapest Sport Arena) it was held in was not elegant enough for this kind of concert, I think the Royal Albert Hall is a much appropriate place for this. We only had one encore, the suite from Maleficent, and reading now that in London he also conducted The Prince of Tides, which is one of my favourite composition by him, makes me a little bit sad. However, I can’t complain because listening to this music for almost three hours, played live on stage, conducted by JNH himself, was a wonderful experience. >>After this the composer played a piece for solo piano he had written very early in his career, but never recorded (sadly I don’t recall what it was called), surprisingly well-developed and mature-sounding. I recognized the final section of that theme from his ONE FINE DAY score, I think. So apparently he re-used it for that film.